Wisconsin has worked aggressively implementing its vocational and trade school at the secondary and post-secondary levels. The Association for Career and Technical Education rated Wisconsin as one of the most effective in offering college-equivalency-credit programs to high school students. Wisconsin's high school integration program has been particularly successful training high school students in construction trades. In an assessment given by technical attainment for Wisconsin CTE students has surpassed performance objectives with a rating of 94.5 percent. The following details provide information on vocational and trade programs in Wisconsin and the fastest-growing trades across the state. Wisconsin provides numerous trade and vocational school options for students. Through trade and vocational schools, community colleges and career colleges, students can obtain training necessary to enter growing fields in the state, such as healthcare and manufacturing. 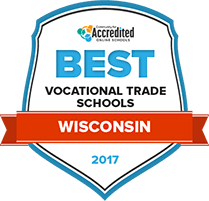 To help students choose between institutions, tuition, financial aid options, student-teacher ratio, quality of programs and more is taken into account in these rankings of accredited Wisconsin trade schools. At Chippewa Valley Technical College, students can pursue trade education whether they are just starting out or have experience in their field and want to advance their career. The applied education programs work to prepare students to support the workforce needs of the region and add value to local communities. CVTC offers over 80 programs in business, health (including dental), manufacturing, applied technology, emergency service, energy, fire safety and diesel education. With eight Eau Claire, Wisconsin locations and four regional campuses, CVTC is accessible to students throughout Western Wisconsin. At Western Technical College in Wisconsin, students receive focused, relevant career preparation. Some of the programs offered at Western Tech include architecture and construction, finance, health sciences, marketing and engineering. Courses can be taken online or on-campus. The programs include apprentice training in which students are paid to learn their trades under a seasoned professional. The school provides extra support for students in “Non-Traditional Occupation” programs, as well as a Career Pathways option which allows students to receive education at a slower pace while they advance their careers. WTC also works to ease the transition to a four-year university, and has program-to-program transfer agreements with many schools. Milwaukee Area Technical College’s vision is to enrich, empower, and transform lives through innovative education. In addition to general adult education (pre-college programs), students attending MATC can choose from business, liberal arts and sciences, graphic arts, television/video production, culinary and hospitality, technical, industrial, and health science programs. The courses in these programs provide training opportunities in specialized industries so students can pursue careers and further education in their fields. Online courses are also available from MATC through BlackBoard for extra flexibility. The school also offers JOBshop, a resource that helps students prepare for and find employment after graduation, either through job fairs, on-campus recruitment, or job placement. Blackhawk Technical College offers both on-campus and online technical training courses. Individuals can study trades in industries like business, manufacturing, transportation, health and public safety. BTC has programs which offer either certification, associate degrees, and technical diplomas, as well as apprenticeship programs which prepare students for work in their industry with hands-on learning experience. The school maintains an open-door policy which allows anyone to enroll in courses and take advantage of the learning opportunities provided. However, certain programs may have prerequisites such as a high school diploma or GED completion. Northcentral Tech provides degrees, certifications, training, and professional development to individuals just starting college, returning to school, advancing current careers or looking to switch fields. From a certificate in administration to an associate’s degree in welding, there are over 100 programs for students attending NTC. With six campus locations in Wausau, Antigo, Medford, Phillips, Spencer, and Wittenberg, Wisconsin, the courses and programs are accessible to students all over the state. The school also offers accelerated programs and flexible online learning options so students can achieve their goals at their own pace. NTC has transfer agreements with over 40 universities. Nearly 50 private career colleges, public vocational schools and community colleges serve the vocational training needs of Wisconsin’s post-secondary student population. Programs are implemented to meet core standards across the major career clusters identified by the U.S. Department of Education. Students looking to sift through the vast array of post-secondary programs can use the search tool below to find the right school. Post-secondary enrollment in career and technical education (CTE) in Wisconsin during the 2013-2014 school year was 128,313. High school CTE enrollment reached 87,486. Four of the ten fastest growing industries in the state employing vocational and trade school graduates are in the healthcare field. Wisconsin student technical skills attainment over the past five years (91.85 percent) surpassed national performance levels (82.25 percent). The Department of Labor predicts that jobs for skincare specialists, aircraft service technicians and medical assistants in Wisconsin will all grow by more than 20 percent each year until 2022. Wisconsin vocational and trade colleges offer programs that students can complete in less than a year to an average of two years, culminating in the award of a certificate or technical diploma. The percentage of vocational programs lasting less than a calendar year in Wisconsin exceed the national average by nearly 5 percent, with nearly 19 percent of all students earning certificates. One of the larger schools in the state, Fox Valley Technical College offers more than 200 career training programs, some of which lead to associate degrees. Since the state adopted the slogan “Open for Business” in 2011, the employment landscape has improved. According to Forbes Magazine, Wisconsin has moved up in the national forecasted job picture from the 49th best state in the nation to the 21st best state in 2015. The economy is buoyed by the agriculture, manufacturing and healthcare fields. The careers projected to make the most employment gains in the next decade support those industries. The greatest number of vocational roles that will open for trade school grads are projected in materials transportation, followed closely by nursing assistants. Nine of the 20 largest employers in Wisconsin center around in healthcare, including surgical hospitals and clinics. The following table reveals the careers with the highest projections in job growth for diploma and certificate grads, followed by a listing of fast-growing careers for students completing an associate degree. Find information on the demand for vocational and trade careers, with projected annual growth significantly higher than the national average in several fields. The U.S. Department of Education states that Milwaukee is home to five post-secondary institutions offering vocational certificate and associate degree programs. Three schools are for-profit private beauty schools, one is a private career college and the Milwaukee Area Technical College is a public college offering certificates and associate degrees. At the secondary school level, vocational and trade school programs are administered by Milwaukee Public Schools, serving 11 high schools. Programs of study include high school courses for college credit and work-based learning through youth apprenticeships. Of Milwaukee’s top-ten employers, five of them are in the healthcare professions: Aurora Health Care, Wheaton Franciscan Healthcare, Froedtert & Community Health, ProHealth Care Inc. and GE Healthcare Technologies. This leads to promising employment opportunities for vocational school grads with credentials as registered nurses, nursing assistants, medical assistants and related specialties. Rounding out the top ten employers in Milwaukee are Roundy’s food distribution, Kohl’s department store and Northwestern Mutual insurance. The Wisconsin chapter of the professional organization for builders and contractors. Provides resources for membership, job safety and education and training opportunities like apprenticeships and field training. Learn about Wisconsin’s vocational and trade programs in agriculture, business, consumer services, health care information technology and engineering. The DECA program mentors Wisconsin students in marketing, management, hospitality and entrepreneurship. It hosts a career conference and partners with the greater business community. Comprehensive resource for nurses in Wisconsin to attend events, find continuing education requirements and learn about state licensure. Launched in 1994, the Network rounds up job listings from many of the leading employers in Wisconsin and provides advanced search options. The site includes career tips and internship listings.